5 Healthy Breakfast Meals Svelte Mum Shilpa Shetty Kundra Swears By! 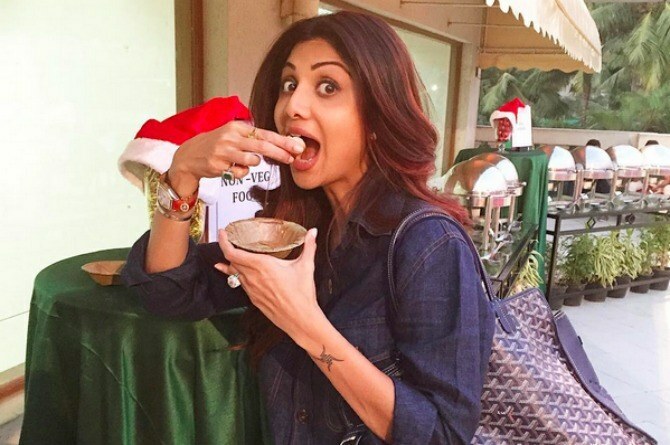 5 healthy breakfast meals the svelte mum Shilpa Shetty Kundra swears by! Bollywood actor, entrepreneur and mother, Shilpa Shetty Kundra has played many roles in her life. But she is most prominently known for her role as a passionate fitness enthusiast. As a yoga follower and teacher, she has helped millions of Indian women get on track with their holistic exercise regime. And quite recently she became the only celebrity proponent of the great Indian diet as the go-to for healthy weight loss. In fact, she keeps giving her fans and followers a sneak peek into her diligent exercise and dietary routine through her various social media accounts. And if you happen to be one of them, you'd know how motivational she can get. In keeping with the spirit to share and motivate, Shetty-Kundra recently gave us a peek into her healthy breakfast meal and invited her fans to include the same in their first meals of the day. But this is not the first time the 41-year-old yummy-mummy has spilled the beans on her personal diet online. She has given us great moments of health over the past few weeks. No wonder then, her diet plans are on point and extremely healthy. We pulled out four more of these interesting healthy breakfast meals Shilpa shared on her Instagram account that are sure to make you healthy and fit in no time. Shilpa shared her go-to breakfast, the granola cereal breakfast. In fact, for the uninitiated she also shared the deets of additions in her morning kickstarter. "Morning kickstart, granola(unsweetened) grated Apple, 4 soaked almonds, pomegranate, 3tbspns yogurt, cherries, 5 tbsps almond milk, chia seeds= fibre power + no hunger for 3 hrs. Full stomach now Workmode," she wrote. She indicates that this is a complete meal and doesn't need any supplement and can be extremely filling for a busy mum. Continue reading to see the other three meals that she swears by and something all mothers should include for a svelte and fit body! Shilpa shared another one of her gems, a simple avocado mix. She wrote: "Saturday Breakfast starter, half an avocado with flaxseeds, hemp seed oil, topped with Chia seeds and pepper. Yumm! Eat "Raw" 1st thing in the morning." She indicated that it should be had first thing in the morning, so no morning tea for mums who may be used to it! Shilpa shared one of her favourite breakfast meals, a dosa, egg and chutney combination. She shared: "Bread free breakfast...Dosas and eggs with chutney..."
Through this post she indicates that one doesn't need to include bread or carbohydrates in their daily breakfast meals, but go carb-free somedays. However, one shouldn't refrain from it entirely as well. An example of this was when she made the bread pudding. Shilpa shared that she cooked bread pudding made with stevia and five seeded bread, especially from her son. She wrote: "Sunday breakfast...Made 2 Bread puddings, piping hot from the oven, Yummm (one with stevia and 5 seeded bread) and one with the usual for my son. Honestly both tasted faaab...must try." She indicates that using stevia in the five seeded bread helps make it healthy and it is also easy to cook.